Georgian houses usually have five ranks of windows and a centrally placed entry; this residence seems to be an example of a truncated Georgian sometimes called a three-quarters house. Georgian features include the original panelled front door with its eight-light transom, the double-hung, six-over-one sash windows with upper-storey casings contacting the cornice, the bellcast hipped roof and the rectangular modillions. The single-pane lower sashes are anomalies. The house was duplexed in 1942 by owner Jim Brown and the Classical Revival entrance porch was widened. In 1985 owner Willem Oudshoorn (352 Moss St, Fairfield) had the missing balustrade on the balcony rebuilt. The stucco exterior is original but it appears that remnants of the old house survive under the present structure. Since 2000, owners Margaret Narain and Susan Nickum, who have lived next door since 1978 (1109 Catherine St), have added an Edwardian sunroom on the back porch of 1111 Catherine, and improved the landscaping with rock walls and iron railings, and slate paths and patio. 1907-28: The original Homestead style house on this property was built in 1896 for the Nisbets. After that was reportedly destroyed by fire, they hired Hooper and Watkins to design a new house, this time stuccoed possibly in an attempt to avoid another disaster. The Nisbets were both born in Cape Breton, NS, Philip Ross (1845-1928) in North Sydney, the son of a shipbuilder, and Catherine “Kate” Gammel (née Musgrave, 1844-1928) in Bras d’Or Lakes, the daughter of United Empire Loyalists. Philip apprenticed as a ship’s carpenter in the North Sydney yards, then went to sea on a ship commanded by Captain James Brown, whose son Tom became Philip’s son-in-law. The Nisbets came to Victoria in 1888. Philip was a carpenter and caulker with Yarrows Shipyard, Victoria Machinery Depot and Turpels Marine Railroad. Kate was an active member of Metropolitan United Church. The Nisbets’ daughters: Lillian Matilda “Lill” married Charles Elwood Watkins in 1905. Victoria-born Watkins had a very successful architectural career, working until two days before his death. Grace “Elinor” Nisbet, a teacher, married school teacher and principal Samuel John Willis, after whom S.J. Willis School is named. Sam later became BC Deputy Minister of Education. [Note:Sam was prinicipal of Victoria High School (1260 Grant St, Fernwood) in 1910-14 when the present high school, designed by C. Elwood Watkins, was being planned and built; the brothers-in-law worked closely together on the planning.] Florence Jane Nisbet married sealer Capt. Thomas Henry Brown (see 1127 Catherine St) in 1894, and they boarded with her parents for several years in the 1890s. The Nisbets’ fourth daughter Stella (1875-1922) remained single and lived with her parents until she died of influenza and pluerisy. 1922-1942: After Stella’s death, Florence and Tom Brown left their home at 518 Selkirk Av (Vic West) and moved back here in order to care for Florence’s parents. Philip and Catherine died one day apart in January 1928. The Browns lived here until their deaths. 1922-49: Florence and Tom’s son James Philip “Jim” (1895-1949) joined the 50th Gordon Highlanders after high school, and signed up in August 1914, at the outbreak of WWI. He left with the first 250 troups under the command of Lt.-Gen. Arthur Currie (1114 Arthur Currie Ln, Vic West). After training at Valcartier, QC, and then the Salisbury Plains, England, Jim was among the first Canadians to cross to France in February 1915 with the 16th Battalion. He fought in the 2nd battle of Ypres when the Germans first used gas, in the battles at Givenchy and St Julien, and was buried by a shell at Festubert. Surviving this, he became an orderly to Gen. Currie, then transferred to the Field Cashier, Canadian Corps. He served with the Army of Occupation in Germany. Jim sailed home on the Olympic, arriving on 12 July 1919 in time for Victoria’s Peace Parade. In the King’s Birthday Honors that year, Sgt. James Brown, was awarded the Meritorious Service Medal. Jim worked as an odd-job man for the rest of his life as he was too ill from the accumulated affects of war in the trenches to work steadily. He married school teacher Dorothy Frances Isabelle Marshall in 1929 in Vancouver. He duplexed the house in June 1942, shortly after his father died and the month his marriage was dissolved. Jim lived at 1115 until the end of his life. He died in the Veterans Hospital at Royal Jubilee. 1111 Catherine: 1945-47: Ethel “May” Fussey, the widow of Robert Fussey, lived upstairs with her children: E. Lorraine, a saleswoman for Spencers; Fern V, a saleswoman for grocers Gelling & Gelling; and Robert Wildon, a millworker at Cameron Lumber Co, which became part of BC Forest Products in 1946. The family came to Victoria in 1944. 1951-58: Weston Bakery (1284-98 Gladstone Av, Fernwood) employee Stewart Ezra Woods (b. ENG, 1891-1967) and Mary (née Hamilton). Stewart was a bakery salesman in Regina and Victoria; he retired in 1956 after 36 years on the job. 1115 Catherine: 1950-52: George Henry and Frances Morris. George was a shoe maker and repairman at 810 Catherine. Living with them were plumber Wesley and Frances Colebank. 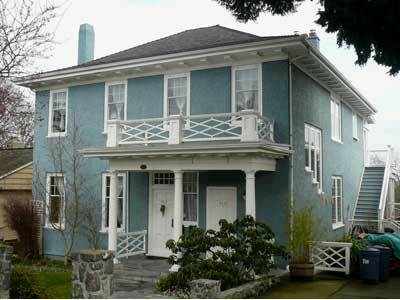 The Morrises resided at 822 Catherine when George died in 1958.